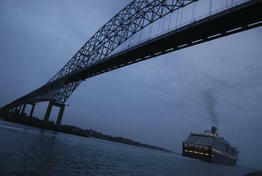 The Panama Canal is celebrating its 101st year as a tourist magnet. Its sheer size (51 miles long and 10 miles wide) and the way it was built—more than 20,000 workers died literally digging a river between the Atlantic and Pacific Oceans—boggles the mind and attracts millions of visitors each year. That number is expected to rise come spring 2016 with the opening of a $5.25-billion expansion project that will double the canal’s capacity and allow today’s mega-sized container ships to pass through with ease. Panama welcomed the Biomuseo, a museum focused on biodiversity, in September 2014. Designed by Frank Gehry (the same architect who did the Walt Disney Concert Hall in Los Angeles and Chicago’s Millennium Park), the state-of-the-art museum is a sprawling and colorful structure that overlooks the Panama Canal. Interactive multimedia exhibits showcase the history of the Isthmus of Panama, discuss the migration of animals between North America and South America, and explain the global environmental importance of that migration. The museum delves into a year-by-year natural and social history of the region, and also has a botanical garden open to visitors. The land along the canal (dubbed the “Canal Zone”) runs about three miles on either side and is a protected area, part of Soberania National Park. Rob Harper, director of business development for NAMU Travel Group and in-country lead for Panama Vacations, a company that offers custom tours, recommends hiring a guide to take you through the lush and picturesque landscape. Travel an hour southeast of the canal and you will find yourself among the winding, charming streets of Casco Viejo, Panama City’s old quarter. Deemed a UNESCO World Heritage Site in 1997, today “Casco” (as locals call it) is a bustling hub of high-end restaurants, shops selling handmade crafts (jewelry shop Papiro y Yo is not to be missed), boutique hotels, and rooftop bars. Bells chime on the hour from churches scattered around every corner, and Spanish and French architecture is well-preserved. While in Casco Viejo, walk over to the Interoceanic Canal Museum of Panama to check out exhibits that explain the history of the region. Note: the museum’s texts are in Spanish, but English-language guests can partake of an audio tour. For the best view of the canal, visit the Miraflores Locks Visitors' Center. The facility features a museum and lookout point where you can watch boats traverse through the locks.